Nintendo has a new 3DS coming out in Japan next month. It's called the New Nintendo 3DS. Do you want one? Have you even heard of it? ​Nintendo Just Announced a New 3DS. It Has Another Analog Stick. Kotaku East was at Tokyo Game Show, and much like our PS4/Xbox One poll from last year, we went around asking people if they were planning on getting the New Nintendo 3DS. Here's a digest of the results. Note 1: The population polled was people attending TGS, many of whom were playing 3DSs when we approached them, so this poll should not be taken as a reflection of the general Japanese public as a whole. 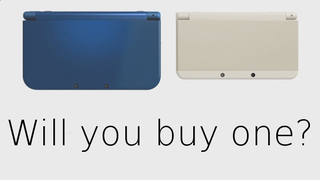 Note 2: At the time of this poll, there weren't very many overt advertisements for the New Nintendo 3DS. Nintendo has only recently begun running ads, so public awareness will probably be different as the release date approaches. The New Nintendo 3DS comes out in Japan on October 11th.